Thanks to an innovative ring laser design, geophysicists at LMU can now measure and monitor Earth’s rotation with unprecedented accuracy. The new instrument in Fürstenfeldbruck will be formally inaugurated this week. The world has so far taken relatively little notice of Fürstenfeldbruck, a town located about 20 km from Munich. It certainly doesn’t rate as a hotspot for cutting-edge science. But that is about to change. For geophysicists based at LMU and the Technical University of Munich (TUM) have built an instrument there which sets a new standard in its field. Buried in an underground bunker built amid cropland and open fields, the device takes up several hundred cubic meters of space. Its purpose is to measure rotational ground motions with greater sensitivity and precision than any other machine in existence. Even the editors of the leading research journal Science are clearly impressed by the dimensions – and the capabilities – of the new instrument. In a news feature that appeared in a recent issue of the magazine, the novel ring laser is referred to as the “most sophisticated” instrument of its kind in the world. The leader of the ROMY (Rotational Motions in Seismology) project is Heiner Igel, Professor of Seismology at LMU. The concept won him one of the richly endowed Advanced Investigator Grants awarded by the European Research Council (ERC), and the LMU went on to supply the additional funding required for its final realization. The initial tests and experiments have been successful, and the instrument will be officially put into service this week. Ring lasers are exquisitely sensitive to rotational motion. They can, for example, measure the Earth’s rotation with extremely high precision. Our planet is never at rest, rotating on its own axis every day and orbiting the Sun once a year. But it doesn’t follow exactly the same course year for year. Its trajectory is subject to minimal deviations. In fact, it behaves just like a child’s spinning top: Neither the orientation of its axis nor the speed of its rotation is constant. It is buffeted by strong winds in the upper atmosphere and by ocean currents at depth, and massive earthquakes knock it out of kilter. But then, the Earth itself is anything but a perfect sphere. No wonder it fails to follow the ideal of perfect circular motion that Aristotle once prescribed for it. Moreover, quantifying the minimal variations in the many different components of the Earth’s motions is not solely a matter of academic interest. For example, all GPS-based navigational systems must be periodically recalibrated in order to take account of these variations, which would otherwise give rise to significant errors in determining one’s position on the globe. This task is currently done with the aid of Very Long Baseline Interferometry (VLBI), which uses a network of radio telescopes to determine the distances between the Earth and selected quasars in deep space that are millions of light-years from us. But this method is complicated and it takes days to arrive at the final result. 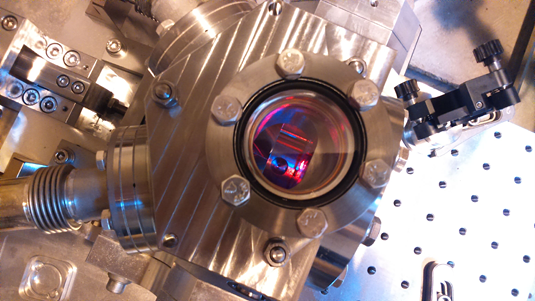 The Munich researchers believe that their new ring laser will enable them to achieve at least the same accuracy in far less time. If they are right, results could be updated within seconds rather than days. But this is only a small part of Heiner Igel’s vision for the new high-end instrument. – He intends to open up a whole new dimension in seismology by using it to carry out more detailed analyses of seismically induced ground motions. For when an earthquake occurs, the ground not only shakes up and down, and back and forth. Tremors are also characterized by tilting and rotational motions around a fixed point. So far, seismologists have had to ignore such motions, simply because conventional seismometers provide no means of measuring them. However, Igel believes – contrary to received wisdom – that a realistic and complete picture of ground motions during earthquakes requires the acquisition and integration of this information.